Well to some of you TGIF! For myself, I'm having to make the most of my last day off *sob*! Happy Birthday Carol! I hope you have a fabulous day! Right then, wishing you all have a fabby weekend! Don't stray too far though, can you believe I've hit 100 followers (well it might not be now, but believe me it hit 100 on Wednesday!) Thank you so much for your wonderful support and comments, they really are truly appreciated! To celebrate this, (and a special anniversary for me!) I can foresee some calorie free candy coming very soon......stay tuned! What a gorgeous card, Aimes! What a fun card for Carol! Congrats on your milestone. ENJOY today. Of course I can believe you've hit 100 - you're cards and creations are AWESOME!! This is AMAZING sweetie - I can't wait for my star prints to arrive - I'm so glad you recommended it to me. I love the ink matched to the buttons - oh, it makes me smile so!! Enjoy your last day - I have enjoyed this week too so will actually be a bit sad to see the kids go back on Monday. There's always the weekend!! 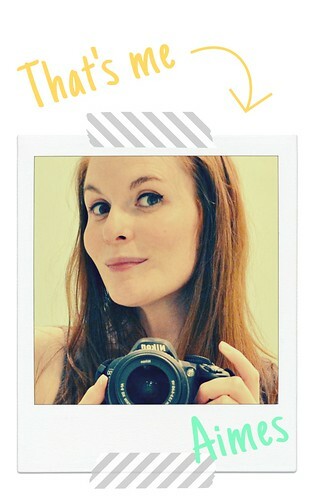 What a wonderful card Aimes, a totally rockin' CAS style! I'm glad you found time to get inky a bit during your break - I've been struggling this week and I'm not happy about it! 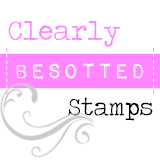 Hopefully I'll get some time tonight and on Sunday to give my stamps some love!! As for 100 Followers - I guess people just catch on slow, lol, it should have hit 100 ages ago!! What a fun card! I love the clean feel of it and the stars are beautiful! Enjoy the rest of your time off! Congrats on your 100 followers, wow! Fabulous birthday card! Love all the fun colors. Have a great weekend! This card is adorable! Love the rainbow stars! Congrats on your 100 followers - no wonder, you rock girl! Pretty, thoughtful card. And congratulations on your milestone. Your work deserves being seen by these and even more! Happy day to you Amies! Thank you so much for the beautiful dedicated card! I love it. I'm in Florida visiting my sister and parents and enjoying my time with them. congrats on the number of followers too! Relax and take in the last hours before heading back to work on Monday. This is GORGEOUS - I lobve rainbow colours too. So pretty. Are you a teacher??? Oh, and I was your 100th follower. YAY!!!! What a great use of this set! I love it, Aimes! Brilliant! I have this set too but can you believe it has never seen ink? I am going to have to give this a try now. Thanks for the inspiration. Congrats on your 100th follower too! Holy cow!! This is just spectacular! Oh my gosh I love this! Congrats on your 100th follower! There'll be many more in future :-) Your card is fabulous as always, Aimes!! So clean and beautiful. Have a wonderful weekend! PS: I absolutely agree, the new pigment inks are a dream to work with. I hope they convert pure poppy soon, it's such a beautiful red. Congrats on your 101 followers Aimes! This birthday card is so lovely and colourful, l'm sure Carol will be pleased to receive such a nice card. Love that you used a different size for this card too, a nice change from the norm. Your card creations are wonderful, no surprise you're hitting 100 followers. And what a cute idea, great going with the stars in the rainbow colors. Aimes this is amazing! LOVE LOVE LOVE it!